More than 2,500 neurology patients in Northern Ireland, including children, are being recalled for a case review. The BBC can reveal that this follows a review of the work of neurology consultant Dr Michael Watt at the Belfast Health and Social Care Trust. 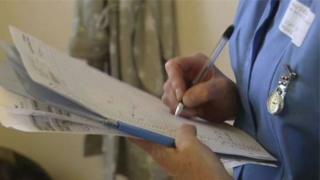 Both the trust and the Royal College of Physicians have carried out separate reviews of patients’ notes. Concerns were initially raised by a GP about a patient’s diagnosis and treatment in December 2016. The Belfast Health Trust said it was a “serious” situation and apologised to patients and their families. Neurology is the treatment of brain conditions. Among the 2,500 under review are children, some of whom may have been struggling with a wrong diagnosis. It is an anxious time for everyone. A consultant who once worked alongside Dr Michael Watt said all of his colleagues were shocked. He said it was a “daunting” time for everyone, but patient safety must come first. For more analysis, read here. Dr Mark Mitchelson is responsible for neurosciences at the Belfast Health Trust. Speaking exclusively to the BBC, he said there was a possibility that some patients had been misdiagnosed and that some, following a review, might receive devastating news. “While we hope this will affect a very small number of patients – the change in diagnosis could potentially be very significant,” he said. “We understand that this must be incredibly anxious for them and, for that, we are deeply sorry for any distress that has been caused. While there is particular concern over a small number of his patients, the trust has decided to recall everyone who is currently in Dr Watt’s care. Neurology deals with brain-related conditions. The trust did not rule out the possibility, at a later stage, it could stretch to patients who died while in Dr Watt’s care. Dr Mitchelson said nine neurology consultants in the trust would be running 200 additional clinics starting from Saturday 5 May. They will see the 2,500 patients including teenagers as young as 14 years of age as quickly as possible. Some patients will be seen by doctors working in the independent sector. “Certainly this is a significant number and, within the neurosciences division, we have never been involved with a recall of this scale,” he said. “These are patients with a wide range of neurological conditions, some of which are debilitating, complex and significantly serious. According to the Belfast Trust, Dr Watt has not seen any patient either in the public or private sector since June 2017. He remains an employee. Nichola Mallon, SDLP, told the BBC that she raised the issue on behalf of several constituents last year. “It is as if we have been beating our heads off a brick wall, trying to get information about what is going on and trying to get answers including diagnosis,” she said. The trust said that it also wanted to reassure patients on already long waiting lists that they would not be affected by the recall. Dr Mitchelson said the consultants were very much aware of NI’s “unacceptable” waiting times and running 200 additional clinics would ensure these patients would not have to wait any longer. When asked by the BBC if the General Medical Council had been made aware of the review and Dr Watt, a spokesperson said that the trust had taken all “appropriate action including liaising with the GMC”. “It remains unclear if Dr Watt has referred himself to the governing body or if the Belfast Health Trust has done so on his behalf,” the spokesperson said. Patients being recalled should receive a letter by post on Tuesday. It will include details about how to make an appointment. An advice line is now operating, telephone: 0800 980 1100. Animal welfare: Is it safe for cats to be vegan?